Digital banking software specialist Backbase has launched a new customer onboarding solution, which promises a complete “streamlined, omnichannel onboarding process” in just 60 seconds. The new solution is based on Backbase’s flagship product, Banking Omnichannel Platform. 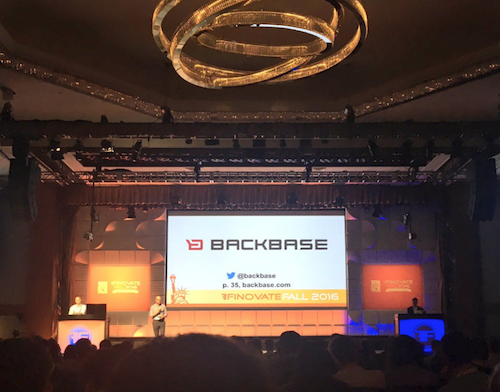 It was unveiled at FinovateFall 2016, a New York-based conference with Banking Technology as a media partner, and won the “Best in Show” award (72 companies presented their solutions at FinovateFall). Backbase’s new offering simplifies the know your customer (KYC) process thanks to its “latest mobile technology”, the vendor says. It also uses data-gathering technologies such as optical character recognition (OCR) for scanning documents (e.g. passports and credit cards) and facial recognition. Backcbase was founded in 2003 in Amsterdam. It is privately owned. It has offices in Atlanta, London, Mumbai and Singapore. The company claims 70+ users of its omnichannel platform, including Che Banca!, Credit Suisse, ING, Hapoalim, KeyBank, NBAD, Al Rajhi Bank and Westpac. Among recent takers are C Hoare & Co and Metro Bank in the UK, IDFC Bank in India and Altyn-i in Kazakhstan. The company has also partnered with Entersekt to use its authentication capabilities on the Backbase Open Banking Marketplace. AmBank will be launching “a new phase of mobile banking very soon”, according to the bank’s new group CEO, Dato’ Sulaiman Mohd Tahir. The solution is provided by Backbase. Lebanon-based Société Générale de Banque au Liban makes its choice. Signicat and Mitek team up to create a solution for Europe-based financial services providers. Digital banking software vendor Backbase has teamed up with Mitek, a mobile capture and identity verification specialist. Mitek’s OCR and document validation capabilities are now available through the Backbase Open Banking Marketplace.